Increase workload efficiencies for staff by automating tasks, centralizing data and enhancing business intelligence. Manage the cost of governing more proficiently and accomplish more with less by adopting tools that quickly integrate with existing infrastructure, enhance usability, and provide insight into current systems. The Frontoffice enables all communications with citizens, companies and organizations. is the link between the Frontoffice and the Backoffice. It contains the Case Management and Documents Management functionality and ensures integration with the authentic sources and backoffice systems. 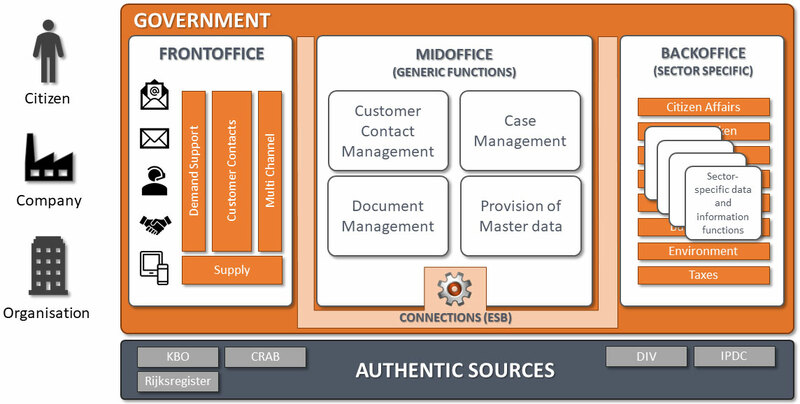 The Backoffice consists of all sector specific systems.